There’s certainly a lot of grist for the mill here, but the part I’d like to focus on is Christian’s attempt to answer the question amongst questions, a question that he seems to think his show answers successfully: What is the meaning of life? 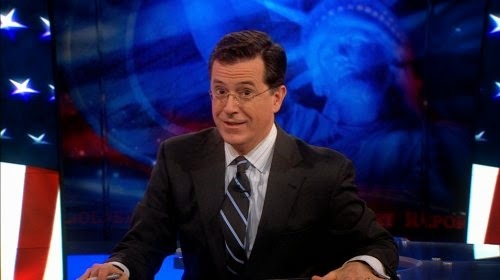 Christian tries to explain that “the meaning is like a map” again, and Colbert says that the Bible is like the key in the corner of the map, explaining “the distances of everything.” There’s a theologically important distinction here that serves to clarify the difference in Colbert’s (a famously devout Catholic) and Christian’s thinking. Christian leaves the discovery of meaning up to the person. In his paradigm, people are something like “free agents,” placing themselves on the “map of meaning” that “Big History” provides, and then making choices about the direction in which they’d like to take their lives. Colbert, in his discussion of the map’s key and its explanation of distances, is talking about sin. As Colbert notes, science is very good at describing life’s events. As Christian’s hesitation evinces, science isn’t so good at discussing life’s meaning. Life, in fact, makes no sense without the ability to discuss Genesis 1-3. Without knowledge of a perfect law-giving creator God, our external actions and internal motivations will remain a mystery to us. Our struggle toward and failure to reach perfection will make no sense. There is a God. We’re not him, but we wish we were. We rebel against him. In order to reconcile us to himself, this God sent his Son to take our just condemnation onto himself. This is his finished work. Getting use to the idea? That’s the meaning of life.